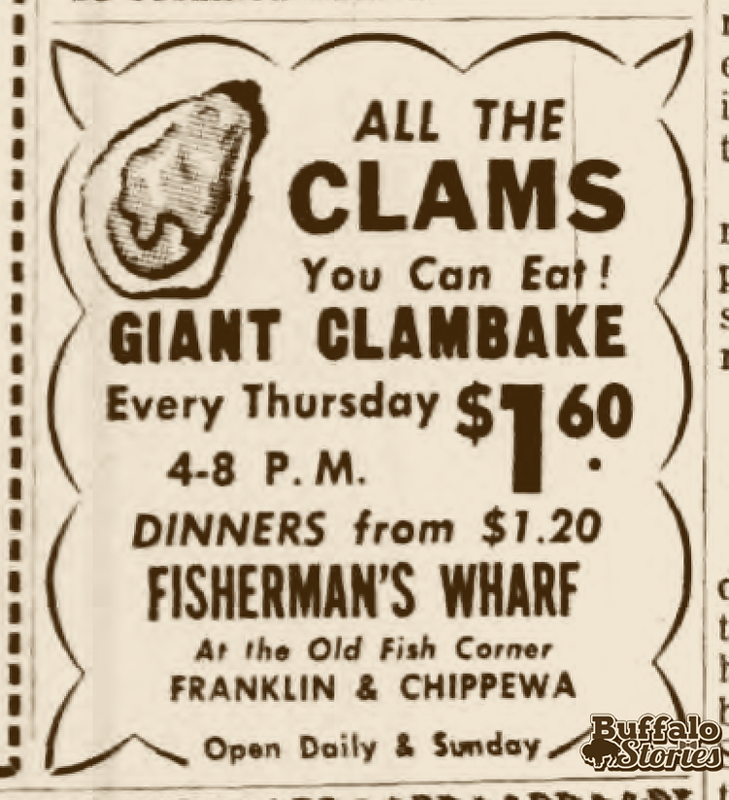 The restaurant was perhaps the seediest of Chippewa’s seedy joints during the strip’s heyday as Buffalo’s de facto red light district. 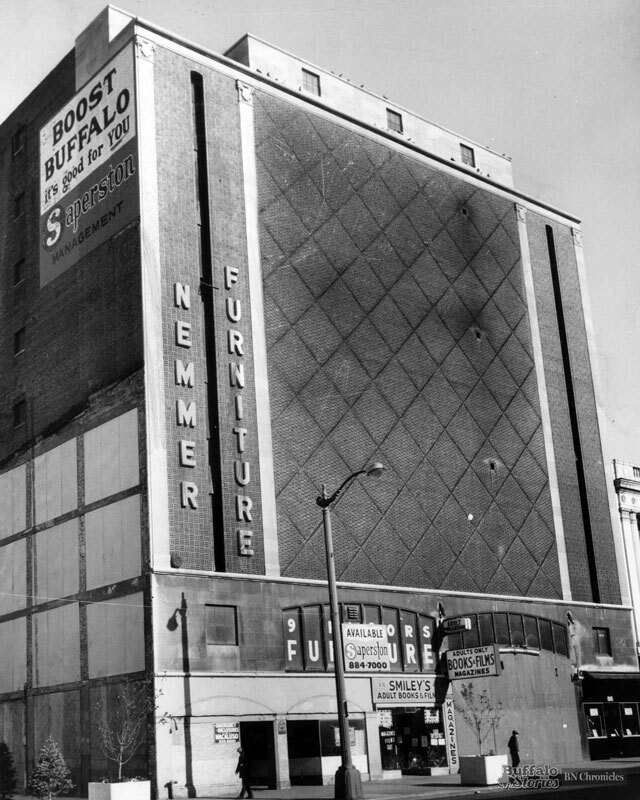 At a State Liquor Authority hearing in 1969, Buffalo Police said the place was frequented by disorderly women, dope peddlers, and people looking to employ disorderly women and dope peddlers. Three cops said they were approached by women soliciting them for immoral purposes and offering marijuana for sale inside the tavern. It was the epicenter of the mid-1970s scene where one judge estimated that up to 40 prostitutes worked the street each night. The going rate was $20; the bargain rate $15. Just to the south of the Fisherman’s Wharf building on Franklin Street was the place last known as the Villa Nova Hotel. 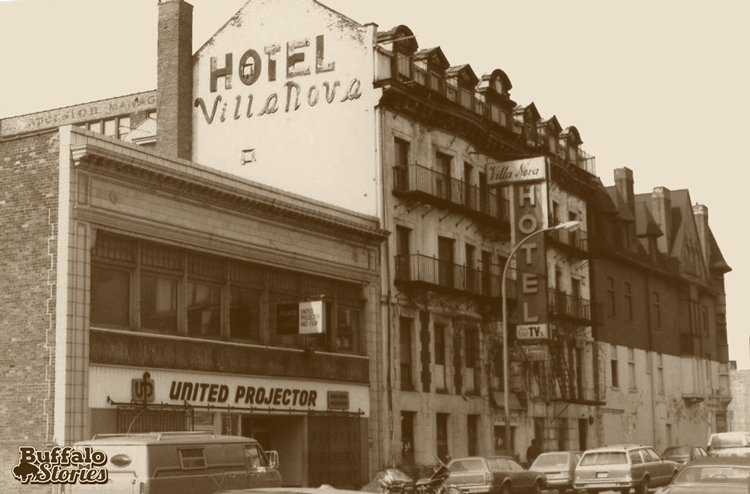 The Villa Nova started life as the Cheltenham Hotel just before the 1901 Pan-American Exposition, during which anti-liquor crusader Carrie Nation may have been the most famous guest. 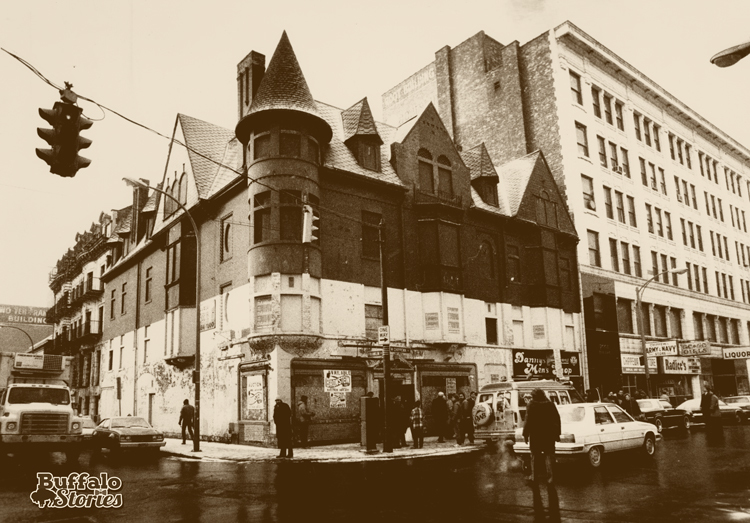 Hope was high that the building could someday be renovated into apartments when an arsonist struck the abandoned building on a spring day in 1989; it was demolished soon thereafter. A few months after the fire, the now garishly painted yellow and black Fisherman’s Wharf was bought up with the hopes of a Chippewa Street revival. “With a little imagination and foresight, Chippewa Street could come roaring back,” realtor Jay Heckman told News Reporter Paula Voell in June 1989. For the same story, developer Myron Robbins told Voell he bought the Fisherman’s Wharf building simply to save it from being knocked down. Three years later, Robbins asked for permits to tear the building down. 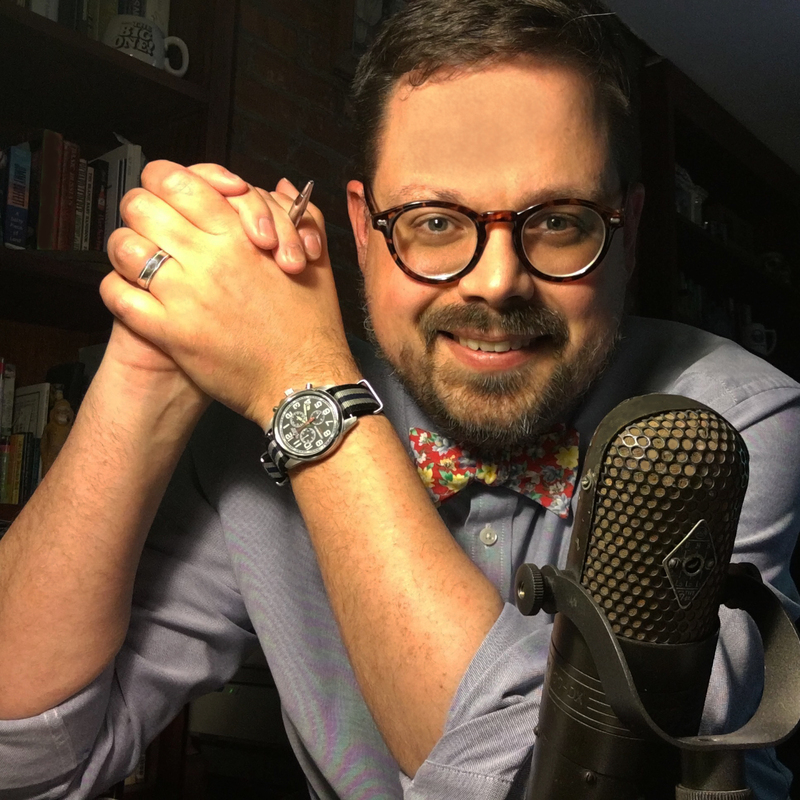 The following year, in 1993, Judge Frank A. Sedita II ordered an emergency demolition. Five years later, in 1998, the $400,000 Soho nightclub was built on the spot. Cops on the Chippewa beat today are looking for rowdy young people and underage drinking. 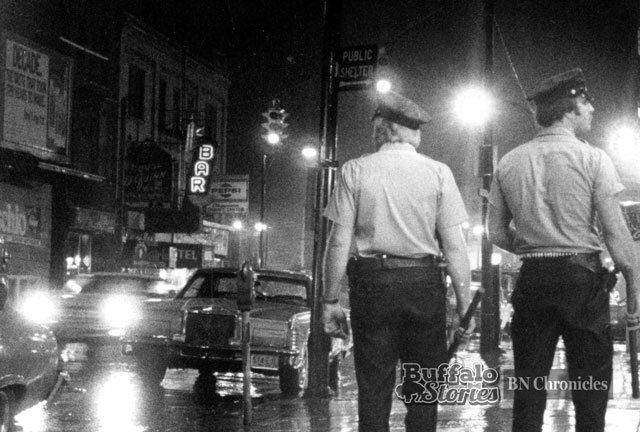 It was a different world on Chippewa Street in 1977, when Franklin Station officers David Schweitzer and Larry Rammuno were walking the prostitute-filled streets of what was then Buffalo’s red-light district. The officers are standing in front of what was then — and is now — the Calumet Building. Today, Go Go Girls and the Chippewa Army & Navy Store have been replaced by Bacchus Wine Bar and Mighty Taco. 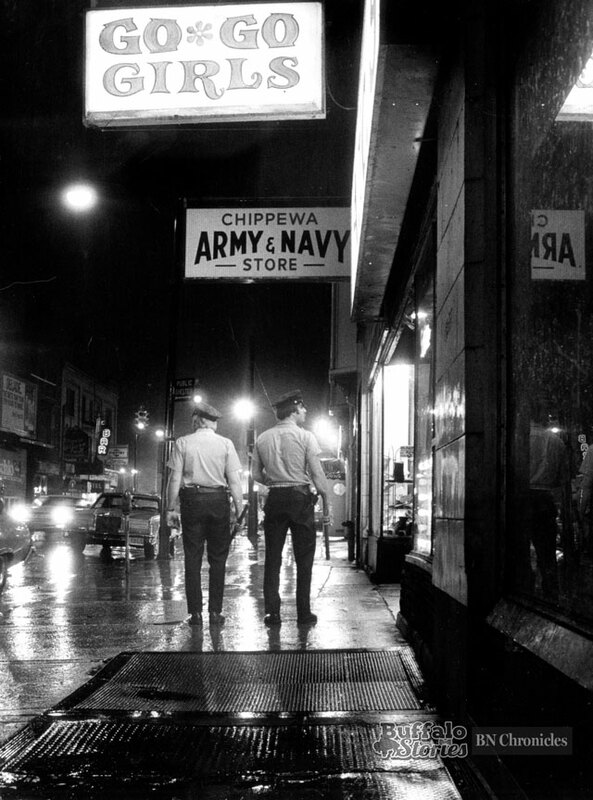 Behind the officers, just out of frame, was the infamous Fisherman’s Wharf restaurant — now the site of Soho. Across the street, other infamous gin mills and dance joints like House O’ Quinn and Cosy Bar are visible. These were rough places for real characters — a far cry from the sanitary Michelob Ultra atmosphere of Chippewa today. The corner of Main and Chippewa has had different looks through the years, but perhaps none as urban and vibrant as this view in 1946. 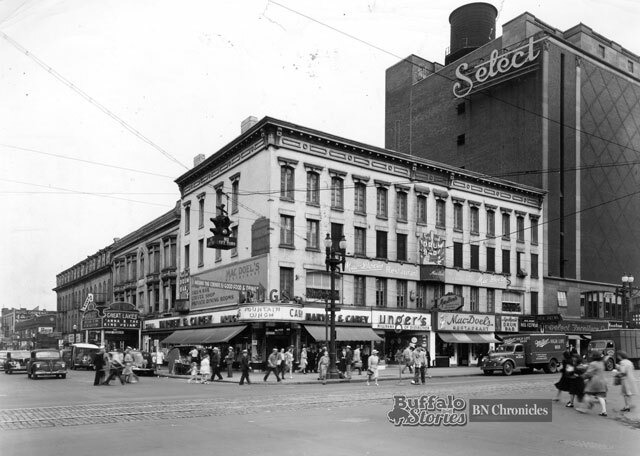 The now-gone building right on the corner, with its lunch counter and soda fountain, was one of 12 Harvey & Carey Drugs locations in the City of Buffalo in 1946. 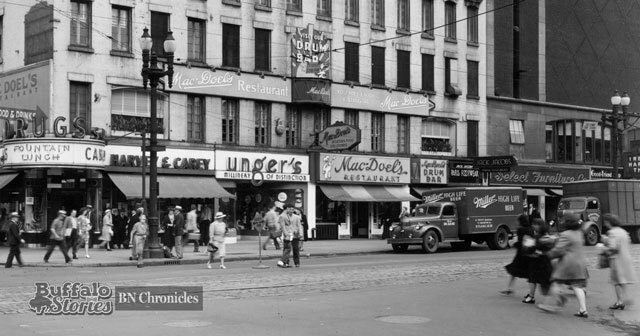 Looking at the Main Street part of the corner, you can see Unger’s millinery and then the famous and well-remembered Mac Doel’s Drum Bar. Just out of the frame to the right is the marquee of the Paramount Theater. Up Chippewa Street, we have a densely packed metropolitan scene, with the Great Lakes Theater, a Deco restaurant, no fewer than eight neon signs, double-parked delivery trucks and plenty of people. The look is a bit more subdued these days.